Eze is a fascinating medieval village on the French Riviera about halfway between Nice, France and Monte Carlo, Monaco. With its rough grey stone walls, narrow, winding streets and defensible hilltop location, Eze has the look and feel of a mountaintop castle right out of a fairy tale. 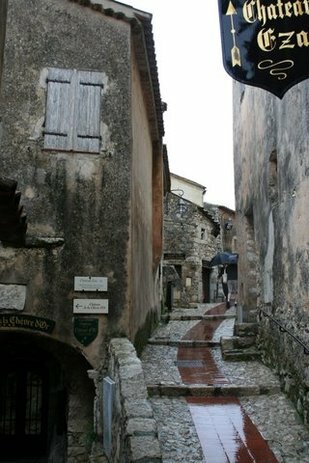 Eze is one of those places where you can just imagine sword carrying knights and elegant princesses roaming these same streets you now walk on. This is a great place to visit if you are on a cruise ship that has docked along the French Riviera in Cannes or Nice or in the harbor at Monaco. Most cruise ships offer an excursion to Eze. The drive to Eze on winding mountainside roads offers many beautiful views. The village of Eze sits like an eagles nest on a large rock about 1300 feet above the Mediterranean Sea. The view is spectacular but be warned - the streets are narrow and steep. They were designed for donkey carts almost 800 years ago! They are especially slippery on rainy days. The oldest building in the village is the Capelle de la Sainte Croix and dates back to 1306. After hundreds of years of Eze battles between Romans and Moors, a castle was built in 1388. For the next several centuries, French, Turkish and Spanish armies continued to battle over this mountaintop stronghold. In 1860, the people of Eze unanimously voted to become part of France. The motto of the village is the phrase: "Isis Moriendo Renascor" which means, "In death I am reborn." Though the castle has been destroyed, it has been replaced with a magnificent garden that offers stunning views from the sheer cliffs to the rolling countryside to the blue Mediterranean far below. Eze is a very picturesque place. Be sure to have your camera batteries charged and extra memory cards available because you will find fantastic shots around every corner of this charming mountaintop village. If you'd like a clothing optional swim, La Plage d'Eze is a nearby clothing optional beach. Watch our video of Eze, France below.